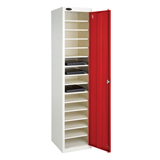 Made from welded steel, this 8 Shelf Storage Locker features a single reinforced door and comes with shelves that are easy adjusted to suit the height of multi-dimensional products. The strong exterior frame acts as a deterrent against theft and provides excellent security once locked and stowed away. 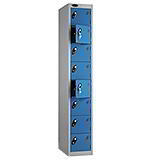 Fitted with a standard cam lock (but also available with a hasp and staple lock at no extra cost), this storage solution is an ideal choice for businesses needing to store multiple devices like laptops, phones or data sensitive documents in a safe and secure location at the end of the day. 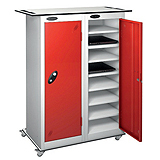 So, for environments looking for compact storage, consider our range of shelf storage lockers and get your space looking neater! 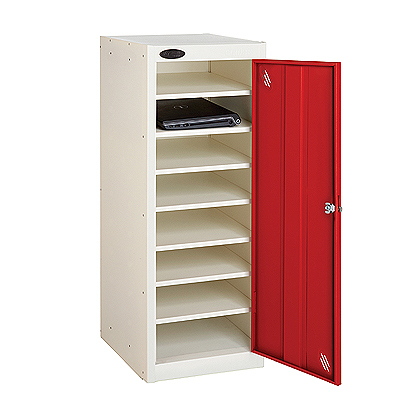 Single door makes it easy to store a number of items at once.